Bonnie Mincu joins me on this episode. Bonnie spent 23 years in a Fortune 50 corporation as a marketing manager, training manager, executive coach, and organizational development consultant. She left her consulting firm in 2000 to do similar work on her own. But, without the structure of fast-paced deadlines, she found herself floundering and avoiding her desk. This was when she discovered she has ADHD. 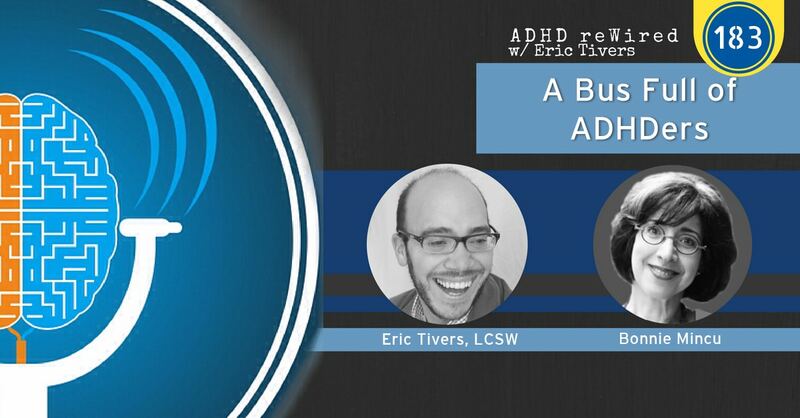 She built her business around coaching and training individual ADHD clients. Since starting Thrive ADHD in 2001, Bonnie has developed a number of training tools and programs. In this conversation, you will hear Bonnie list and describe the characters that she has developed. These characters are riding the bus in our brains and take turns driving the bus. You will also learn how these characters can impact each other. Bonnie is launching a new membership-based training program called, Productivity PathFinder. [06:12] – Bonnie explains a new concept that involves a way of thinking of your brain, and characters in your brain. [07:12] – Bonnie says we frequently use terms to describe what is happening, but they aren’t accurate. She provides an example of this with procrastination. [09:36] – Bonnie describes characters in your brain. You will meet Steady Eddie, Whiny Winnie, Impatient Iggy, Overwhelmed Oscar, and Emotional Emma and the personalities all of these characters have. [21:08] – Bonnie talks about time sense and being able to estimate the amount of time a task will take. [24:10] – Bonnie explains that she does not have a poor time sense, which led to her not realizing she had ADHD. [24:58] – Bonnie continues listing characters, describing Helpless Hannah and Critical Calvin. [32:10] – We talk about decision making and the cause of difficulties in this process. [33:35] – Bonnie explains how these characters can interact and how to bring certain characters to the forefront in situations. [38:40] – Bonnie describes Disorganized Derek, and she explains the cause of disorganization, and its impact on people that don’t want to be disorganized. [43:01] – Bonnie explains the four quadrants of organization. [44:35] – We discuss the idea of multi-tracking vs. multitasking. [51:07] – We come up with a character that Bonnie may be missing, Distracted Dave. [52:28] – Bonnie describes Emotional Emma and the role Critical Calvin plays in Emma’s actions. [54:30] – I address the fear of being judged. [57:53] – Bonnie shares a tip for managing shame. [59:28] – Bonnie talks about visual images for these characters she has developed. [1:00:38] – Bonnie talks about Productivity Pathfinder. I’m having trouble downloading the pdfs. Hi Carol! Please try the download links again. We sorted them out now. Thanks!